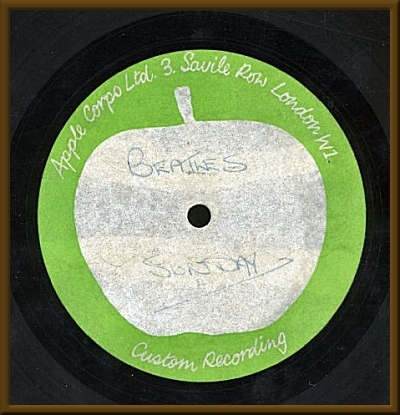 THE SOURCE - Acetates - Apple - "Sunday"
A fantastic opportunity to purchase what must be one of the world's rarest and most desirable records. This is an absolutely 100% original UK 12" one sided Apple acetate on Apple Records Custom Recording Label. Handwritten on the label in blue pen is the title "Beatles Sunday". It contains recordings from the Let It Be sessions at Apple Studios. Some of the rock 'n roll medley you will have heard and seen in the film but "Blue Suede Shoes" has not been officially released. The version of "Dig It" is the long version and the version of "I've Got A Feeling is officially unreleased. A fabulous record which captures the immediacy and spontaneity of the Apple sessions beautifully, a real pleasure to listen to. There are surface marks all over the playing surface but they have no real detriment to the sound quality, a few crackles on track one but overall any surface noise is very light and doesn't interfere with the listening. Looks good, plays very good. Overall the sound is very clear and vibrant. The label is clean and intact and in excellent condition. This rather oddly titled acetate was a surprise to me. In the The 910 Guide, Doug Sulpy states that the tracks listed below are found, sourced from an acetate, on Celluloid Rock (Yellow Dog). However, in other references to these performances, Sulpy doesn't mention it. on this site, I had always doubted it. The recordings on Celluloid Rock simply sounded too clean to be sourced from an acetate. Then this disc turns up. So perhaps Doug was correct. These performances date from 26 an 27 January 1969 (a Sunday) during "The Get Back Sessions". They would certainly be cut from EMI reel E69742. The tracks were mixed by Glyn Johns on 13 March 1969. The acetate must date from around the mix date. The label style would also coincide with that date. This disc was auctioned in late 2004 and might possibly be the source of the recordings found on Celluloid Rock.